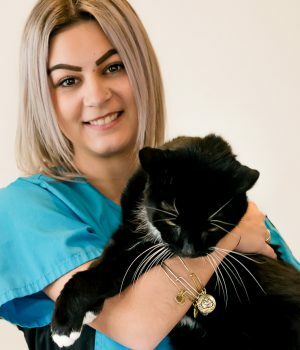 Having graduated from the Mental Health and Addictions Worker program at Canadore College her understanding of compassion and empathy is reflected in the work she does with animals and their owners. Randi has had a passion for animals for as long as she can remember, and this guided her to be a foster mom for a number of cats and dogs over several years. She has dedicated her home and devoted her time to care for all animals and she believes that all animals deserve a happy and healthy life. Her welcoming, friendly and outgoing personality help to make pets and their owners feel comfortable when coming to visit. spends time swimming, fishing and relaxing with her friends and family.